Many statistics here base on the famous GPLRank. Please visit this site. I collected all the export files I do whenever I beat one or more PB. Now I have some statistics proving that GPL isn't easy if you don't drive very much. 2002/12/29 All cars negative!!!!! Whoohooo. The BRM was missing: An 8:18 at the Ring and better times at Zandvoort and Spa did the trick. 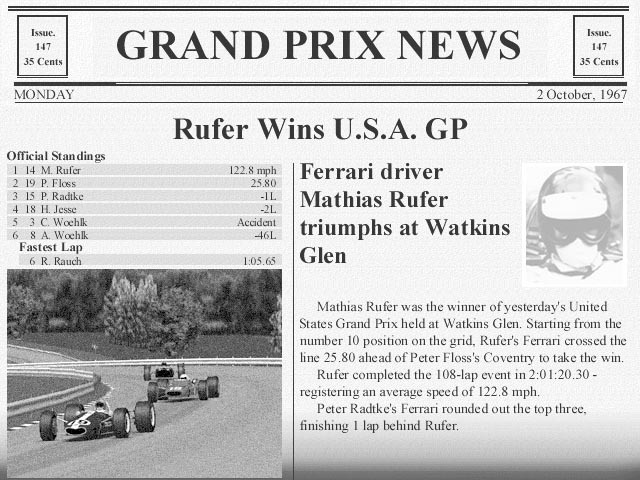 2002/10/27 I win my first ever full Grand Prix in Watkins Glen, EOLC Grid B. 2002/03/?? Got into Online Racing because I've now ADSL. 2002/03/03 I finally managed to get negative on all tracks !!! Whoohooo !! The 3:20 barrier at Spa is no more, thanks to the fast Eagle. 2001/08/21 First sub 1:06 lap at the Glen with the red car, in an AI Race remarkably. 2000/11/28 Final success at Monaco, using the red beast. 2000/04/01 (kein Aprilscherz!!) 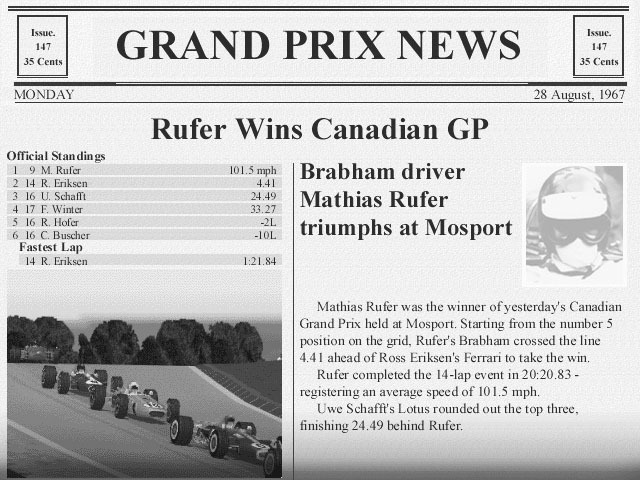 1:05.55 at Watkins Glen, finally using the Lotus. Managed to get round Monaco in less than 1:30, using the Ferrari.